Home > Contests & Giveaways > Sunshine and Fun to Come at Bookmans in August! The summer days are still long here in Arizona, and everyone is looking some great ways to beat the heat and humidity in August. Lucky you, Bookmans’ August calendar is overflowing with free events for every member of the family. If your jam is painting, gaming, live music, pets, Pokemon, or trivia, your local Bookmans has your entertainment needs covered! School is about to start and that means a lot of back to school shopping ahead for parents. If you live near our Flagstaff store, your child can win a seriously cool prize pack with Bookmans Flagstaff’s Back to School Giveaway! You can enter this cool contest at the Flagstaff store from August 1 – 7! Hurry on in for your chance to win some incredible school supplies! Do you have a serious love of gaming? Bookmans’ August events will not disappoint! Our video game tournaments are always packed with gamers, so… we thought we’d add FOUR of them to the event roster! Win prizes and challenge other players for the ultimate title at Bookmans Midtown August 11. Up in Flagstaff? Join Kikori Con at Bookmans Flagstaff for a Video Game Tournament! Our East and Northwest stores are both hosting Super Smash Bros. gaming events on August 25th! Don’t worry if video games not your thing. We are a store full of tabletop game enthusiasts, and Bookmans Mesa is having their monthly Tabletop Game Night with Arizona Game Fair on August 23rd! There are so many Pokemon events at Bookmans that it’s hard to catch ‘em all! This month we’ve got Pokemon MeetUps at Midtown, Pokemon PileUps at our East store, a Pokemon Leagues hosted by Team Rocket AZ at Mesa! The Bookmans community has shown up in droves to every painting event. That’s why Bookmans is expanding our Studio Nights in August so even more people can participate! First up this month is Studio Night: Paint Edition at Bookmans Midtown on August 3rd. On August 17th, it’s Bookmans Phoenix’s turn to host a Studio Night! Bookmans Flagstaff is shaking things up with a Glass Aspen Painting class where you’ll create beautiful, hand-painted glassware. Music lovers, listen up! Bookmans East’s Studio Nights: Vinyl Edition is here to teach you how to make your artistic mark on some vinyl records on August 24. Have something you love that you want to capture on canvas? Head to Bookmans Mesa for their “This I Love” painting session on August 30. How does a trivia night or two sound? If this sounds like music to your ears, you’re going to want to mark those calendars for House of Horrors Trivia Night at Bookmans East on the 17th in Tucson. Up in the Valley? Bookmans Phoenix is bringing everyone back to their favorite decade with Trivia Night: 80’s Movie Edition August 24th. If you’re more into music than horror or the 80s, check out Chicks with Picks at Bookmans Phoenix on August 16th. Mesa’s Spotlight on Sound features local musician Simon Wong and performer Matthew Henry Hall will be at Bookmans Flagstaff too! How about some adorable, adoptable animal events? Meet Your New Best Friend Adoption Day at Bookmans East brings adoptable animals of all kinds to our store so you can find the perfect pet to fill your heart and home with joy. Bookmans Flagstaff is bringing art and animals together for Dog Days of Summer Animal Adoption and Caricatures with the Coconino Humane Society and Heavenly Pet Art. Did we mention that this wonderful local artist is creating FREE animal caricatures to encourage and support adoption?! Speaking of art in Flagstaff, did you know that you have an artist within you? Bookmans’ Flagstaff store is also having a Tie Dye a Bookmans Bag art night on August 4th where you can show off your artsy self! Arizona, you just cannot get enough ukulele events, and Bookmans is happy to oblige your ukulele interests! Learn how to play this popular instrument at the Mesa store’s Ukulele Party on August 11th. Bookmans Phoenix is hosting a Ukulele Jamboree where uke enthusiasts of all skill levels can come on down and jam out on August 25th! Don’t have a ukulele? Browse our music section and find one that’s just right for you! Everyone knows that Bookmans stores across Arizona rock Storytime to promote early childhood literacy. We’re happy to announce that the Bookmans Midtown weekly Storytime event has moved to Thursday mornings at 10 am. This weekly Storytime will now also include a fun craft session too! Phew! That’s a lot going on at Bookmans this month! 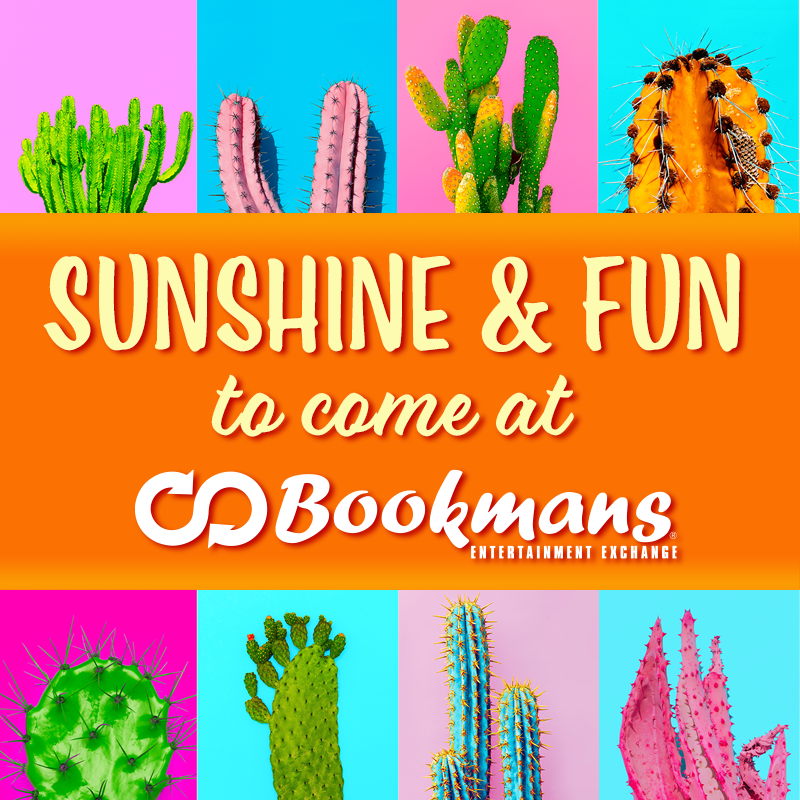 Remember that all Bookmans events are totally free and totally fun, so don’t hesitate to make your local Bookmans store the go-to for summer fun this August! We’ll see you there, Arizona!